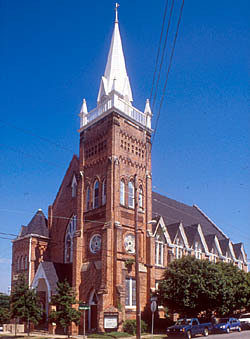 This brick Gothic Revival style church was built by the first independent congregation of African Americans in Raleigh. The building’s story, which begins a generation before actual construction, is a telling reflection of the aspiration and tenacity of freedmen. The congregation that formed St. Paul consisted of the slave membership of Edenton Street Methodist Church, which met in a frame building. In 1853, Edenton Street’s black membership moved this building to the corner of Edenton and Harrington streets, after the white congregants bought and relocated to old Christ Church. In 1865, the black congregation severed its ties with the Edenton Street church and affiliated with the African Methodist Episcopal Church. Ministers of St. Paul took leading roles in black political activity during the Reconstruction Era. Freedmen in North Carolina held their first lawful assembly at St. Paul in 1865. In the years afterward, the church furnished some of North Carolina’s foremost black spokesmen, among them State Senator Rev. Henry Eppes, Legislator Stewart Ellison and the Rev. R. W. H. Leak, a leader in late 19th-century Republican-Populist fusionist movement. It was during Leak’s tenure that the congregation began construction of a new church, to be made of brick, comparable to the city’s best. In 1884 the cornerstone was laid; construction, however, was to take 25 years. Money for materials trickled in slowly, as washerwomen, maids, nurses and cooks contributed all they could despite prevailing low wages. Periodically, meetings were held at which members pledged to live on bread and molasses in order to set aside needed funds. Finally, in May of 1901, the congregation marked the sanctuary’s completion with a two-week rally. Governor Charles B. Aycock delivered a speech honoring the occasion; the Raleigh News & Observer termed the Gothic-style building “one of the handsomest colored churches in the South.” The planned spire, however, had yet to be built. Eight more years passed before preparations were complete. Then, as building materials lay ready, a Fourth of July balloon strayed onto the wood-shingled roof, starting a fire that consumed all of the building but the brick walls. An outpouring of donations from both the white and black community allowed the rebuilding of the church to the original specifications. Work was completed in June, 1910. The church continues to hold a central place in community life. During the Civil Rights era, St. Paul frequently served as a meeting place. The Rev. Jesse Jackson delivered his “rainbow coalition” speech there during his run for the presidency. In 1998, the church completed work on an attached education building, which draws its architectural cues from the century-old sanctuary. St. Paul AME Church, a Raleigh Historic Landmark, is located at 402 Edenton St. It is open for worship services and other congregational events; call 832-2709 for further information.